Orders will be delivered by Cheerleading the week of Sept. 12. Looking for men's sports shirts? 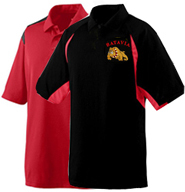 Visit the Batavia Boosters page and design your own polo...and more! Available with long or short sleeves. A flattering contoured fit and clear rhinestone bling for that extra zing! Cotton and Spandex blend. With an updated fit and figure-flattering details, this extra-soft rib-knit cotton has a dash of Spandex to retain its shape. A flattering contoured fit and big, bold screen print sets this long-sleeve tee apart. Cotton and Spandex blend. A flattering contoured fit and big, bold screen print makes this short-sleeve tee a real eye-catcher. Cotton and Spandex blend. A big and bold screen print design on an extra-soft heavyweight 50/50 cotton blend tee..